Simon Evans was flying a drone in a residential back yard in Worcestershire, UK, when he clipped a tree and lost control of the device. One of the sharp, quickly rotating propellers hit a toddler named Oscar Webb in the face and sliced through his eyeball. 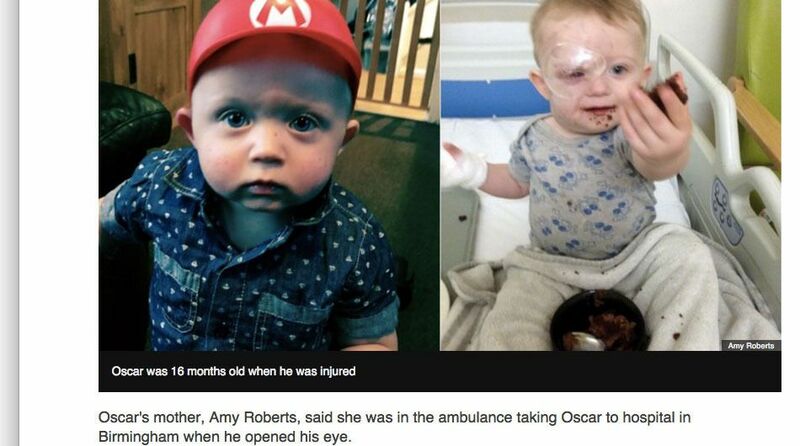 Oscar required emergency medical care, including operations attempting to save his eye, but doctors now believe that he will not be able to see out of that eye again. More surgeries will be needed before he can be fitted for a prosthetic eye. Oscar’s mother stated, in an interview with the Telegraph, “You don't realise the dangers, you don't expect something so severe to happen from what people call toys, I wouldn't class them as toys." This isn’t the first time that a civilian-owned drone has severely injured someone. A drone crash at Seattle’s 2015 Pride Parade left a woman with head injuries. In Pasadena, California, an 11-month-old girl was injured when a drone crashed near her and sent sharp shrapnel flying at her face. A stunt by TGI Fridays involving “mistletoe drones” went badly when a drone got tangled in a reporter’s hair and cut her nose. Singer Enrique Iglesias was injured onstage in front of his audience when a drone operator filming the concert lost control of his device. In Seattle, drones are also causing property damage, with amateur enthusiasts crashing errant drones into the Space Needle and the Seattle Great Wheel. In 2013, the SPD attempted to start a drone program, but shut it down after protests from the public. Despite the surging popularity of drones, some of which as so cheap that they’re marketed as toys for children, the law hasn’t quite caught up to the sudden prevalence of tiny civilian-owned flying machines. A law left over from World War II defined a homeowner’s property as ending 83 feet in the air, and stated that the FAA controls the air above 500 feet, but modern drones can fly in the range between those two domains. The FAA recently began to allow commercial drone permits, but it is still struggling to regulate hobbyists. For people who are injured by drones flown by hobbyists, their ability to recover damages may depend on a vague clause in a homeowner’s insurance policy. If you or a loved one has been injured by a drone, it may be time to speak with a personal injury attorney. Drone injury cases are still legally tricky, and may be difficult to recover damages without the help of an attorney.